Stocks are closing broadly higher on Wall Street, giving the S&P 500 index its third weekly gain in a row and putting it within reach of the record high it hit last September. Banks led the gains Friday after JPMorgan Chase reported a strong quarter, helped by higher interest rates. The country's largest bank by assets rose 4.7%. Other banks also rose. Disney soared 11.5% after unveiling a new video streaming service to go up against Netflix, the industry leader. Netflix fell 4.5%. The S&P 500 rose 19 points, or 0.7%, to 2,907. The Dow Jones Industrial Average rose 269 points, or 1%, to 26,412. The Nasdaq rose 36 points, or 0.5%, to 7,984. Bond prices fell. The yield on the benchmark 10-year Treasury rose to 2.56%. Stocks are rising broadly in midday trading on Wall Street, putting the S&P 500 index on track to post its third straight weekly gain. Banks are leading the way higher Friday. JPMorgan Chase jumped 4.5% after reporting a solid increase in earnings. Other banks also rose. 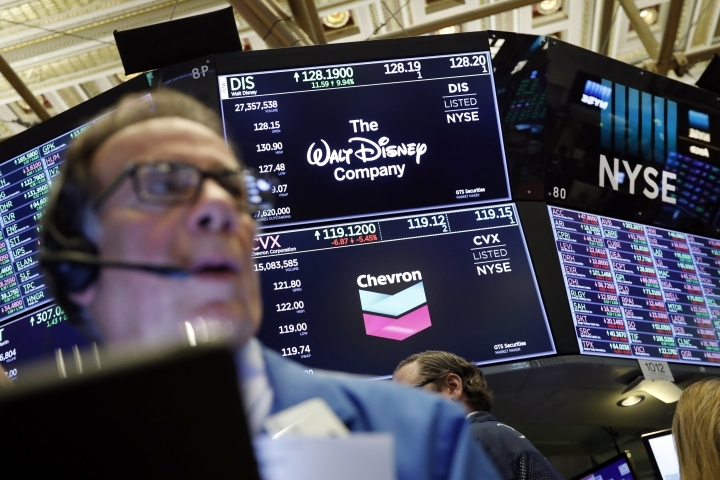 Disney soared 10.3% after unveiling a new video streaming service to go up against Netflix. Netflix was off 3.9%. Chevron sank 4.6% after announcing a deal to buy Anadarko Petroleum for $33 billion. Anadarko skyrocketed 33.7% higher. The S&P 500 rose 13 points, or 0.5%, to 2,901. The Dow Jones Industrial Average rose 209 points, or 0.8%, to 26,350. The Nasdaq rose 18 points, or 0.2%, to 7,966. Bond prices fell. The yield on the benchmark 10-year Treasury rose to 2.55%. JPMorgan Chase jumped 3.5% early Friday after reporting a solid increase in earnings, and Disney soared 10.5% after unveiling a new video streaming service to go up against Netflix. Netflix was off 3.1%. Chevron sank 4.6% after announcing a deal to buy Anadarko Petroleum for $33 billion. Anadarko skyrocketed 32.5% higher. The S&P 500 index rose 18 points, or 0.6%, to 2,906. The Dow Jones Industrial Average rose 256 points, or 1%, to 26,410. The Nasdaq rose 38 points, or 0.5%, to 7,985. Bond prices fell sharply, sending yields higher. The yield on the benchmark 10-year Treasury rose to 2.55% from 2.50% late Thursday.